Yes, there was a long build up to this event, as we booked our tickets three months before the man in the mask arrived to London town. And it seems we weren't the only ones, as the queues outside Brixton Academy were far bigger than what we imagined...an eccentric mix of bboys, bgirls, honeyz and indie/emo dudes. But that's Doom, he's a character who knows how to create anticipation and intrigue around what he does, his following goes beyond hip hop and of course, he can spit abstract concepts in rhyme like no one else. The set kicked off with The Herbaliser as the opening act. The guys are talented musicians and they gave a great performance - and that's not easy when you're opening for someone like Doom. But, sound quality was not the best, bit too bassy...but we just thought it was the nature of Herbaliser's music and kept sipping our beers waiting for the big moment. 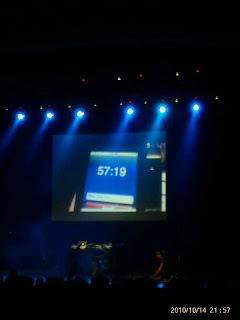 Eventually a timer appeared on the screen behind the stage with 57:19 on it...we initially thought it had a 'deeper' meaning, but as soon as the mask appeared it became evident that it was a timer for the performance, as it started counting down. The show was good. Doom was accompanied by a Fat Man Scoop sound a like who worked hard to hype up the crowd at every possible opportunity. The crowd responded, this was a big event afterall and tracks from Madvillain, Operation Doomsday, King Geedorah and Dangerdoom were all present.